1) Pre-heat the oven at 160°C. Lightly grease or line a round 8 inch deep pan with parchment paper. 2) Beat egg yolks with sugar until the colour lightens and turns slightly pale. Sift the flours and fold into the egg yolk mixture slowly. If it gets too dry, it's time to add in the yogurt and canola oil. Mix until all the flours are well blended and the batter is smooth & lump free. 3) Whisk the egg whites and cream of tartar until foamy. Gradually add in sugar and continue to whisk until fluffy and soft peaks form. 4) Fold 1/3 of the egg white batter into the egg yolk batter. Gently fold in the rest of the egg whites without deflating the batter. 5) Pour the batter into the baking tin, give it a couple firm taps on the table to release large air bubbles and bake it for 40 mins or until a skewer comes out clean. 6) Once baked, remove cake from the pan and leave to cool on wire rack. 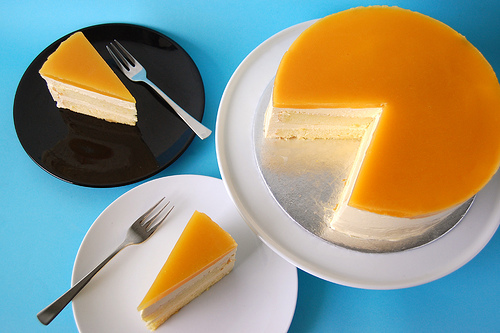 7) Trim and slice cake to 2 even layers of 2 cm thick each. 1) In a small bowl, dissolve gelatine powder in hot water. When the gelatine powder is fully dissolved, add to mango puree. Add rum to the mixture. Mix well. 2) In a mixing bowl, whip whipping cream with icing sugar to mousse state. Add the mango mixture to whipped cream. Mix well till incorporated. 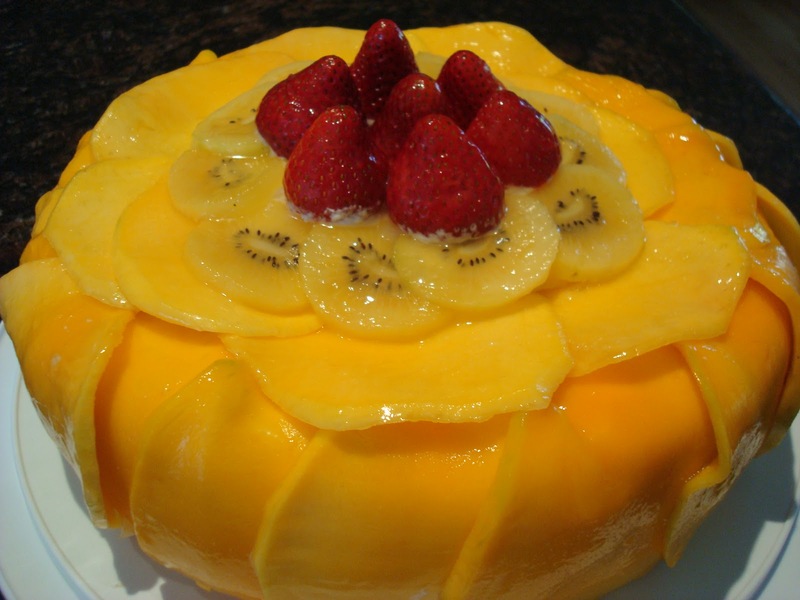 3) Use an 8 inch round cake ring or a cake tin with removable base or springform tin, place a layer of cake and pour in mango mousse. Add half the mango cubes and cover them with some mousse. Lay another cake layer, add the remaing mango cubes and pour the remaining mousse. Make sure the mousse covers the mango cubes. Let the cake chill for at least 3 hours to set before removing the cake ring. 4) After the mousse has set and the ring removed, make mango puree topping. Blend mango puree together with piping gel (add more piping gel if a thicker consistency is desired) and pour on top of the set mousse carefully. Done! In case of not having piping gel What can we use Instead of that.